My English Diary: Contemplating about Learning English 2. Contemplating about Learning English 2. 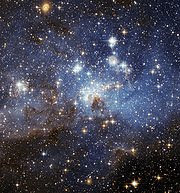 It all begins with the clouds of dust that are countless in our universe. The turbulence that exists inside these clouds results into knots containing high concentration of gases. These knots are so dense that the mutual gravitational forces among the gas molecules led to the growth of the infant star, called protostar, by sucking the substance in it. Through this accretion process the pressure in the center of the new star reaches so high magnitude that the material in the center begins heating up and eventually triggers the nuclear fusion and the release of energy that makes the star shine. But the stars differ in their glittering abilities. Not all of them can attain sufficient brightness to be visible in the night sky. Some of the stars, named by astronomers brown dwarfs, glow quite feebly. This process of star formation somehow reminds me what the foreign language learners usually experience with their language studies. We all, human beings, have the ability to speak and thus to learn a new language. Some people are born with natural linguistic aptitude and can master a foreign language remarkably quickly. However, most of us are not endowed with an innate cognitive capacity for learning languages and we begin to penetrate the complexity of a foreign language by assimilating new grammar rules and absorbing new words and phrases. We gradually learn how to pronounce the words correctly and how to write using a good style of language. The new words, expressions, idioms flow into our brain until one day our mind reaches critical mass and we begin confidently speaking fluent language. The foreign language acquisition takes time and sometimes tremendous exertion. However, some people are not diligent enough and, if become delinquent with their language lessons, usually never come out of the “protolanguage” state (very limited language skills) or just achieve moderate success in foreign language acquisition (just like those dim stars) and can barely express their thoughts with a foreign language. So, let’s be patient and persistent in learning English and keep a positive attitude on the way towards our goal - which sometimes seems as distant as those stars twinkling through the night – to shine with stellarly fluent English!